When you live in a small house or apartment, one big challenge you face is finding furniture to fit the scale of your space. I live in a compact two-bedroom with my fiancée, and furnishing it has been a slow process. Rather than being frustrated by how cramped it can feel, we try to cooperate with the space we have. That means rejecting the idea of a full-sized couch and opting for a larger loveseat. It means storing vertically and hanging what we can. It also means accepting the fact that our eating and living areas needs to share space. We weren't having any luck finding a small dining table, so I decided to build one instead. So you're on the hunt for a new coffee table. You've come to the right place, because today we're sharing tons of resources for tables that won't break the bank. Here are 50 different options from 10 retailers in a variety of gorgeous styles. Thanksgiving is right around the corner, which means that it's time to switch from Halloween decorations to a more festive fall setup. So today we're sharing ten unbelievably beautiful, incredibly unique Thanksgiving centerpiece and tablescape ideas. So if you want to wow your guests with something gorgeous this year, read on. It can be stressful planning out what your Thanksgiving table is going to look like. Do you want fancy? Do you want simple? Natural? The possibilities are daunting. Make your life a little easier by incorporating items found in nature! Small amount of work. Big impact. Everybody wins! Here are a few tips for getting the most of nature this Thanksgiving season! Table runners are a fun way to add some interest to your dining room, and can be a really great opportunity to get creative at the next party or shower that you host. Keep reading to check out these ten unique table runners that you could easily make yourself. Ever heard of fusion furniture? It's an amazing concept that a few designers are really getting right. And Israel-based designer Hilla Shamia is one of those talents! 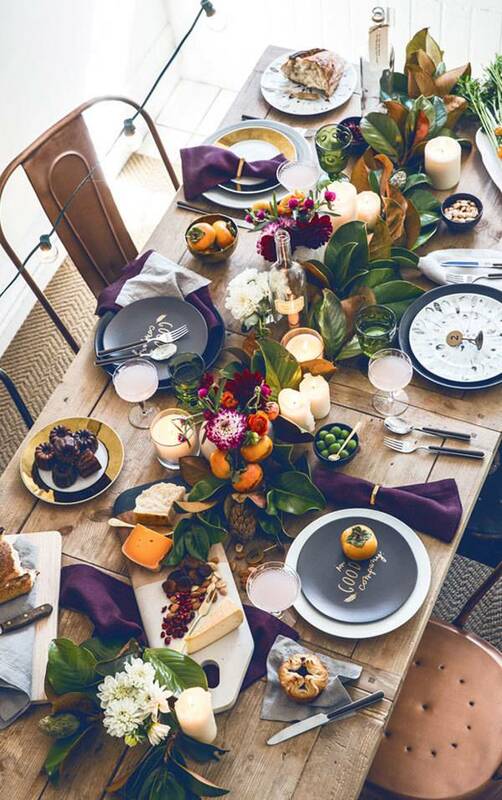 Wow your guests this Thanksgiving by creating a gorgeous tablescape for them to enjoy. Here are nine inspiring projects to take your table to the next level! How to Make a Modern Bedside Table from Scratch! Unimpressed with the bedside table offerings from your local furniture stores? Make your own! Having gone through a recent office makeover of my own, DIY tables and desks just seem to jump out during my Internet browsing sessions these days (which go something like "cute puppy, cute puppy, AWESOME DIY IDEA, cute puppy"). It's modernism month here at the Curbs so, naturally, a roundup of our favorite MCM-inspired DIY projects was in order! Happy DIY-ing! This painted table is all kinds of hot geometric goodness! The real kicker, of course, is that it's super affordable. Oh, and completely customizable! This wood dining table is the perfect blend between rustic and modern. The best part? It's totally DIYable! I like to re-invent and create things around my home and I also love to fill up a person’s belly until they are beyond full...and then heap a dessert on top. A large dining room table, with the ability to seat twelve, was a dream of mine. So, I decided to make it a reality -a beautiful, unique and inexpensive reality. Like, for fifty bucks. Need a little inspiration to bring your office space into the modern era? You're not still using that cardboard desk calendar your realtor sends every year, are you? Well, Capree's the lass to get your time-travel started. One of my main challenges as a creative person (I like to think of myself as such!) is the mess that comes along with it. It seems to me like a good solution to the constant moving of project piles would be a good storage solution, like this DIY desk.